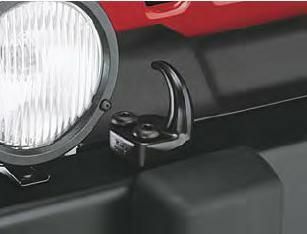 Tow Hooks for the Jeep Wrangler are rated with a towing capacity up to 5,500 pounds or 1.5 times the vehicles GVWR (depending on vehicle). These tow hooks securely mount to the frame and are fully tested for durability and load capacity. Available in Black, front, 5,000-lb capacity, set of 2. Black, rear, mounts to Hitch Receiver or without Hitch Receiver, 4,000-lb capacity. Item # 82204120 - Rear Set of 2 Tow Hooks. For use without Trailer Hitch, only.